It will blow your guests witch socks off!! the suggested cheese, nut and fruit tray. The witch fog is made with dry ice pellets in the cocktail beaker. PLEASE READ THE CAUTIONS BELOW ON USING DRY ICE IN DRINKS. It really is not ice. It is frozen carbon dioxide (CO2) at -109 degrees F. (-78 Celcius). It dissipates into a gas. Caution #1: Use it in a well ventilated space. Caution #2: It is cold enough to cause frost bite. Don't touch it and don't try to drink as ice! Handle it with tongs. 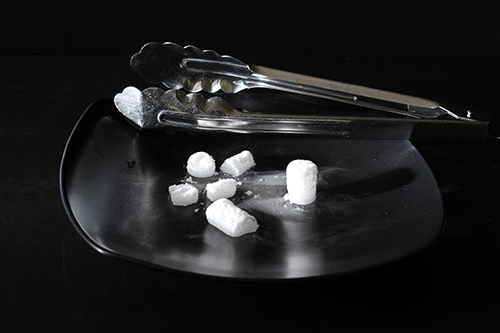 Caution #3: Use food grade dry ice, meaning it is used for soda fountains, for transporting and even making food. Living in a small town, I found it difficult to find and even on the internet. I was assured that the dry ice pellets I had purchased could be used in a drink. To be extra careful, I decided on Caution #4. Caution #4: Do not put dry ice in an individual glass. Caution #5: You will find lots of examples on the internet where the glass is "smoking hot" with dry ice. I love the look but prefer to stay on the safe side. If you choose to be daring, at least WAIT until all of the dry ice has dissipated. The best parties are the safest parties! If you are making a punch, especially for children, use a punch bowl or something similar to be placed inside a large cauldron or a container equally fun. Add a little water to the cauldron along with the dry ice. The fog will come out from the cauldron while the punch remains cold and safe from guests accidently drinking dry ice pieces. Mix vodka and sweet vermouth in a glass cocktail pitcher. Note that the color is amber. Add the Blue Curaçao and the color turns light green. Add the dry ice pellets as close to serving time as possible. DO NOT ADD REGULAR ICE with dry ice pellets. What will happen? I decided to not find out. Garnish cocktail glass, Spread a layer of color sprinkles (such as green) on a plate. Line the rim of the glass with a lemon quarter or dip the glass in simple syrup. Dip the glass into layer of sprinkles. You may have to roll the edge of the glass into the sprinkles. Add a cherry to the glass. Serve your guests by pouring a brew right before their eyes! 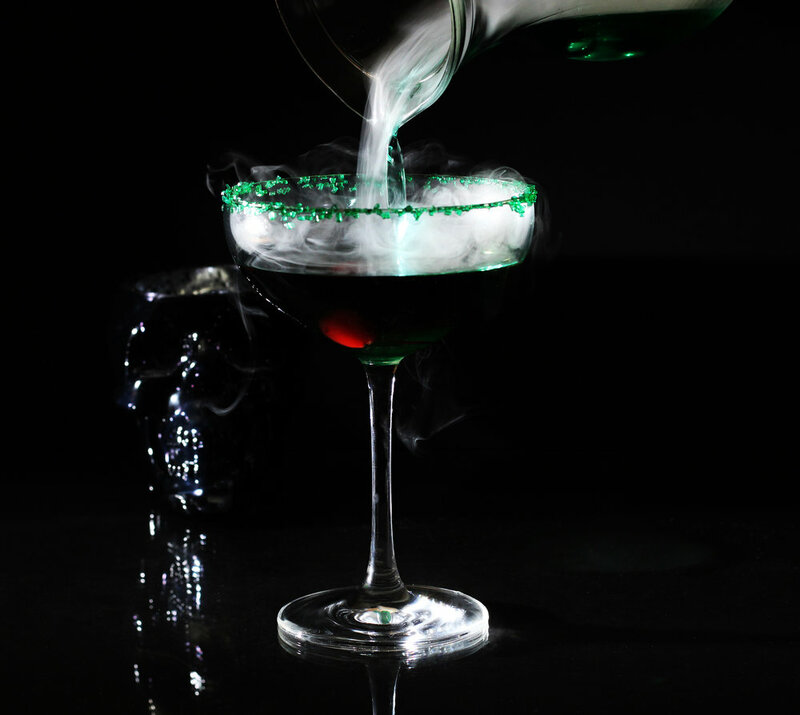 Notice that the color of the martini, once the dry ice has been added, turns a very, very dark green--almost black! Whenever serving alcohol, I always make sure there is sufficient food and snacks to go along with it. A cheese, nuts and fruit platter can be made up quickly. And the quantity will of course depend on the number of guests. Choise of ingredients will depend upon personal taste but cheese, nuts and fruits are always a wonderful staple. My Preachy Note: Have a fabulous holiday party but serve and drink smartly, responsibly. High protein foods such as cheese and nuts remain in the stomach and slows down the absorbsion of the alcohol, from HINTS FOR SENSIBLE, MODERATE, AND RESPONSIBLEALCOHOL CONSUMPTION AND PARTY HOSTING, Indiana Education. For a martini, I found that a blue cheese such as Roquerfort with its pungent flavor goes rather well. Here I added slices of Granny Smith apples but in retrospect, I think golden delicious would have been a better choice. Its sweetness would have complemented the sweetness found in sweet vermouth and the Blue Curaçao. The cheese roll is an Insalata Panino, a gorgonzola cheese with genoa salami and sundried tomato. I added that simply because I was hungry. There are other flavor types of cheese rolls available in a local deli. know how much I love you?